Synergy TT 2010. New date, better weather, and fast times. Ted giving his approval of the TT course. The 2010 edition of the Synergy Time Trial landed on a new date. Moving from its normal mid-May early season time slot to early July. This change of date was welcome for the better weather conditions, but resulted in fewer triathletes participating in the race due to the fact that 2 of the most popular triathlons on the Minnesota triathlon calendar; Timberman Triathlon and The Life Time Fitness Triathlon, taking place on the same day. Despite the lack of top caliber triathletes in the field the time trial racing was great. Many Endurance Athlete athletes participated in the Synergy TT as a test of their fitness at this point in the season as well as great opportunity for everyone to get together after a hard effort and share racing and training stories. Coach Greg was hoping to race as well, but was asked to help support the race by volunteering and helping Bob Sumada with course set-up and marshaling. This also gave Greg a great opportunity to cheer on all participants and encourage the EA athletes to their best performances. This years Synergy TT was a great success, but us here at Endurance Athlete are hoping that it moves back to its original mid-May date next year so that more triathletes can participate and allow this race to be a perfect early season fitness test to all cyclist. Thank you Now Bikes and Fitness, Synergy Cycling Team, and Bob Sumada for putting on a great race. 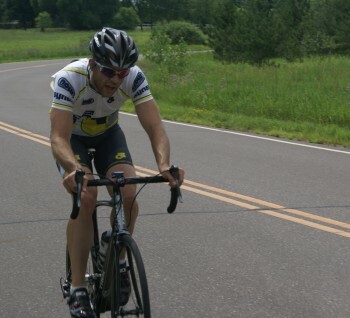 Greg "Stick" LaVick enjoying the suffering of a TT. 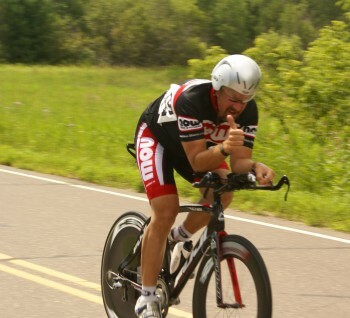 Ryan Krug showing everyone that you do not need a TT bike to place high in your category. Ryan got 2nd in the Cat 4 race without any aero equipment. Coach Greg cheering on racers as they approach the finish line.